Originally a stable, the Grande Ecurie retains many of its original features like stone walls and wood ceilings and floors. In addition, the upstairs windows command excellent views of not only the 2-acre lawn but mile upon mile of typical Cognac countryside. Three good-sized bedrooms sleeping up to 7,two bathrooms and a large open plan lounge/kitchen/diner. 5 quality gites on a magnificent renovated 19th Century Charentais farm with large heated swimming pool, only minutes from Cognac. Open all year around, a perfect place to unwind and relax or to use as a base for excursions to some of Frances best attractions. Whether it's cycling down quiet tracks through the vineyards or dreamy walks along the Charente river, learning about and tasting the world famous local produce or choosing between the excellent regional golf courses, your stay here will have you ideally placed to make the most of your next short break or holiday. A fully equipped, modern and clean kitchen, TV & DVD, hair dryer, bed and kitchen linen, towels, pool towels, washing machine, bbq and a private terrace area with garden furniture. 13x6m heated swimming pool, 2 acre lawn for football, children's playground, football, boule, badminton. A large open barn incorporating children's indoor play area, table tennis, table football. Bike hire. Quality of the Gites, Grounds and facilities were top class. Laban struck the perfect balance between being available for any questions on the region but not at all intrusive to everyone's own personal space. Pool was extremely well maintained and the wide range of bikes were perfect for exploring local countryside. Thanks for the stay and hope to see you again.Best Gites we have stayed at! Rent, snyggt och bra utrustat. Mycket bra för familj med barn då det finns pool, stora gräsytor för aktiviteter som fotboll, cykling, badminton mm. Bra omhändertagande och information från ägaren. Tillgänglig hela tiden och trevliga arrangemang som välkomstdrink och barbequekväll. This was the third timethat we had stayed at the Gites and the second time in this property. We love it, it's very peaceful and the Hosts are very friendly and so helpful. We've done a mixture of self catering and eating out - recommendations always available from the owners. We have also appreciated the use of bikes available to guests and have explored the many paths through the vineyards. There is a bread van that comes every morning but local supermaarkets aren't far away but you do need a car. Can recommend the Remy Martin Cognac tour as an excellent trip out as well as the Chocolate factory where you can make your own. 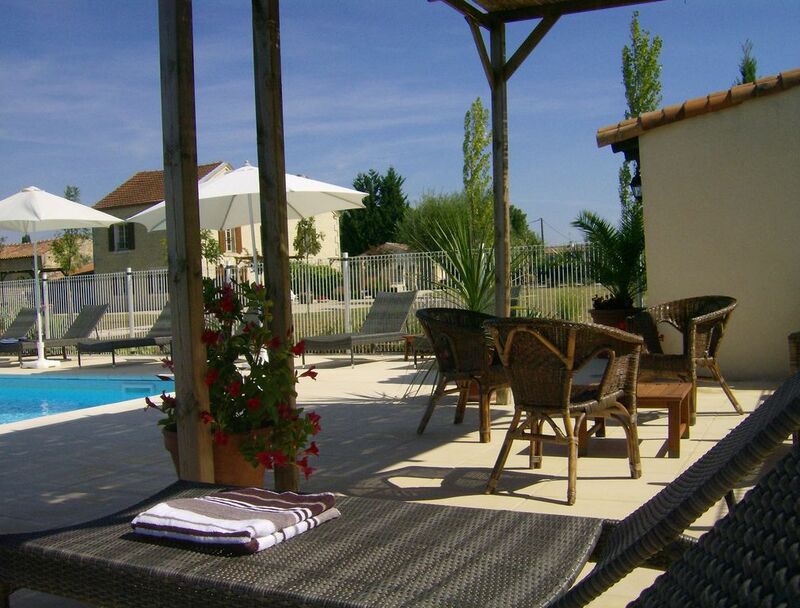 The Gites are very clean and comfortable with modern furniture and all you need for a holiday. Can't recommend it highly enough! Accueil très sympa et propriétaire très disponible. Piscine fort appréciée par nos grands adolescents. Beau gîte confortable pour 6 personnes. Endroit très calme au milieu des tournesols et des vignes. A recommander ! Only 4 hours south west of Paris, 1 hour north of Bordeaux, and just one hour from La Rochelle airport. Perfectly situated for exploring the Atlantic coast region or historic towns of Saintes, Rochefort, Angouleme and of course Cognac. La Fournerie is surrounded by vineyards but yet only 10 minutes from Cognac town.